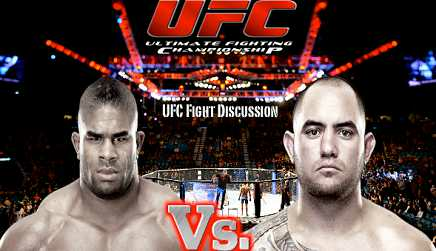 The fight between Alistair Overeem vs Travis Browne is the co-main event of the UFC Fight Night: Shogun vs Sonnen. There were many upsets of the night - Shogun Rua was defeated by the new lightweight division UFC fighter Chael Sonnen via guillotine submission in the very first round. While Alistair Overeem known as the KO artist and was the heavy favorite fighter who is ranked as number 6 of the world in heavyweight division was also defeated by the number 11 Travis Browne. IT was a totally upset wins in the main and co-main event of the UFC Fight Night (August 17, 2013). This event took place on August 17, 2013 at the TD Garden in Boston, Massachusetts. It was a stunning knockout victory by Travis Browne. Who saw that coming? Not Overeem but the camera replay. A front kick from Browne to the Overeem's jaw and made him dropped to the canvas followed up by a big punch that put overeem near to sleep. The action resulted the referee Yamasaki to step in and waved the fight - it's over! A gutsy performance by Travis Browne after he was in serious trouble a couple of minutes before breaking Overeem's jaw. If not, Travis Browne will be badly beaten by Overeem. But in every fight, there's luck on it as many fighter believe the power of luck. And it shines that night. Congratulations to Travis Brown for that brilliant display of performance! Watch the video replay highlights .